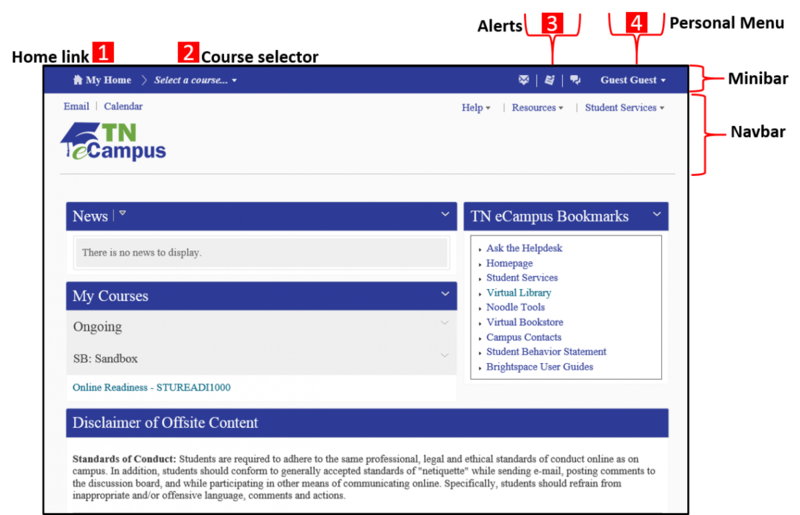 All TN eCampus programs and courses are accessed through D2L Brightspace, a state-of-the-art, user-friendly online learning management system. My Home is your starting point inside Learning Environment. It is also your organization's homepage where you can access widgets, tool links on the navbar, organization-level content, and other available resources. Course Home is the first page you see when you navigate to a course. Similar to My Home, it also contains widgets, tool links on the navbar, and resources that enable you to access your personal information, account settings, and course specific content. The course selector lists your courses. You can sort them by course name or by date last accessed. You can also select specific courses from the course selector and pin them to the top of the list for easier navigation. See accessing the course for more information. The minibar is your main navigation tool to courses and personal settings in Learning Environment. The minibar contains a link to My Home, the course selector, alerts, and your personal menu. See the minibar for more information. Alerts in the minibar notify you when you receive messages, updates, or subscription updates. See identifying alerts for more information. The personal menu contains links to your profile, notification options, account settings, and logout. Click your name on the minibar to open the personal menu. The navbar is your main navigation tool within a course. It displays the course name, tool links, custom links, and custom link groups. Each course can have its own unique navbar to provide relevant tools and resources. Access these D2L YouTube videos to get a jump start on your semester!